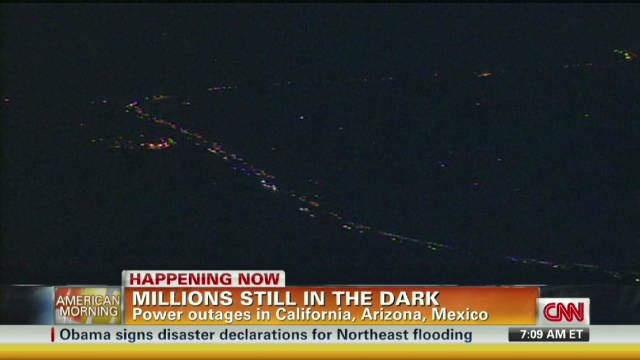 (CNN) -- A short-circuit at a substation in North Gila, Arizona, set off a series of failures that led to the massive power outage that left millions of people in California, Arizona and Mexico in the dark, San Diego Gas and Electric Co. President Michael Niggli said Friday. Niggli said automatic safeguards prevented the Thursday afternoon blackout from spreading even farther, but he said an investigation will be necessary to determine why safeguards that could have further limited the outage did not work. "The question becomes how did that ripple through the rest of the system," Niggli said. The Federal Energy Regulatory Commission said it would jointly tackle that investigation with the North American Electric Reliability Corporation, an industry trade group that enforces national reliability standards. The power was back on throughout the region Friday afternoon, but its effects lingered. San Diego schools took the day off, and a sewage spill caused by the outage prompted health officials to warn swimmers off some beaches. The San Onofre Nuclear Generating Station near San Clemente, California, which provides electricity for San Diego, remained offline Friday after automatically shutting down when the blackout cascaded across the power grid. The reactors at the San Onofre plant went into normal shutdown mode after the units detected "grid disturbance," said Eliot Brenner, director of the U.S. Nuclear Regulatory Commission's Office of Public Affairs. The shutdown posed no threat to workers or residents, he said. Niggli and the state's power grid manager, California ISO, asked customers to continue conserving energy to prevent further blackouts as a result of what Niggli said was still a "fragile" power system. Officials in San Diego, where the largest blackout occurred, said the crisis went as smoothly as they could have hoped. "The bad news is the lights went out. But the good news is that everything we have prepared for worked like clockwork," San Diego County Supervisor Bill Horn said. Fire officials praised people stuck in elevators for staying cool while waiting for rescuers to arrive, and police noted a lack of looting and other criminal activity. Officials also thanked the U.S. Navy for powering up generators aboard its many ships in port, freeing up the utility to restore power sooner to other customers. "I think it's one of these things that show people how important community is," San Diego Mayor Jerry Sanders said. The power outage began Thursday afternoon. An Arizona Public Service Co. worker was handling a capacitor at a substation in North Gila when the short-circuit occurred, Niggli said. That knocked out a major transmission line that carries power to California. Low-voltage readings sent the nuclear plant into shutdown, and the blackout was on, he said. The blackout brought business in the region to a halt. Trains and trolleys stopped in their tracks, transportation authorities said. San Diego International Airport shut down for a time. Businesses had to close. People were stuck in elevators. The power failure caused sewage to spill from San Diego's wastewater treatment system into the Torrey Pines State Beach area as well as the Sweetwater River. Utility workers were able to get the power back on for San Diego residents by early Friday. In addition to San Diego, power returned late Thursday for consumers in Arizona, where about 56,000 customers lost power, and for all but a smattering of customers in California's Orange and Imperial counties. About 170,000 people in those two counties were affected, utility officials said. Mexico's border cities, including Tijuana, and parts of Mexico's Baja California and Sonora states were also affected by the outage, Mexican authorities said. It was unclear Friday whether power had been restored to all of those communities or how many people had been affected. California residents need to continue conserving energy through the weekend, Niggli said. The area's power system is still "fragile," and customers need to limit the use of air conditioners and other energy-hungry appliances while utility officials work to bring the San Onofre plant and other facilities back on line. Beach activities in the southern California city will also be curtailed for a few days. The San Diego Department of Environmental Health said it would post warning signs at all beaches north of the Scripps Pier through Del Mar and Solona Beach. The department is also posting contamination warnings at Bayside Park in Chula Vista and the San Diego Bay near Silver Stand. The city also warned that tens of thousands of people might have to boil water after a number of pump stations and filtration systems shut down. Authorities quickly ruled out terrorism, which was on many minds in the days leading up the 10th anniversary of the September 11 attacks. "Considering the fact that we are so close to the 11th, subconsciously I think it was hitting people a bit," said Ryan Valencia of San Diego. Valencia was among the thousands who got caught in huge traffic jams that occurred when power went out to traffic signals. He said he spoke with his girlfriend and her family, who also asked if it was related to a terror incident. "In all honesty, at first I did think it was a little too convenient, a little too widespread," Valencia told CNN. "I thought it was a little fishy." It could take weeks or months to determine how the outage spread, utility officials said. CNN's Chelsea J. Carter, Alta Spells, Greg Morrison and Tina Burnside and CNNMexico.com contributed to this report.